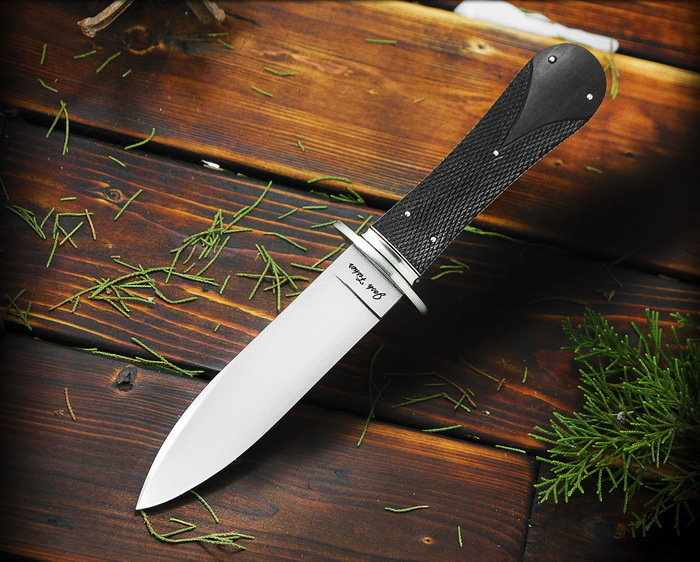 ABS Journeyman Smith Josh Fisher's classic San Francisco Spearpoint Hunter is forged of 1084 High Carbon Steel with a 5-inch clip point blade, 10 inches overall. It has a comfortable checkered Ebony handle with a bronze guard. I have been making knives since 2007, I earned my Journeyman Bladesmith stamp in 2012 from the American Bladesmith society. I am currently a full time knife maker in Murchison, Texas, where I live with my wife, Kim, and our two children, Karis & Bear.